Assignment: Create a personified animal on a T-shirt for a young child. I was jumping up and down with joy when I saw the assignment. I LOVE creating characters and since having my son, I LOVE doing anything and everything for children. I thought this would be so simple and I had it in the bag! Little did I know, this is the beginning to another round of craziness. With Labor Day coming up (4-day weekend), I would only have 4 solid days to complete this assignment before the deadline. I was determined to make something for my 2.5 year old son Connor. I have made a t-shirt for him before when he was younger and he LOVED it. He demanded to wear it a lot when I first gave it to him! I wanted it to be something super cool that Connor would love. He loves giraffes, elephants and pandas. I thought giraffes and elephants were done too many times, so I wanted to do pandas. He has been obsessed with people riding bicycles too, so an animal riding a bicycle would be pretty cool. Another idea was, they have “water day” at school every week, where they wear their swim suits and play with water outside. He loves water day and looks forward to it every week, so I also wanted to explore the idea of an animal wearing a floating ring. If I ever made this into an actual t-shirt, he can wear it to school on water day! Here are a few of my sketches. I don’t know why somewhere along the line I started drawing a bear. My son has never seen a real bear before (there are none at our zoo) so I was not quite sure it were a good idea, but it looked cool amongst all my sketches. I almost settled on it because I could see it as a cool t-shirt. All was good until I showed my sketches to my lovely husband, the electrical engineer. Why would I show it to an engineer you’d ask?! I don’t know. I guess I was desperate to seek affirmation? I would have been happy if he briefly looks at it and say oh these are great! Instead, he went through my sketches in 0.5 seconds and he said no. No no no. He said, you need to do something that is super cool and that has not been done before. He gave me a few thoughts which were absurd and I totally forgot what they were. Then he said why don’t you draw dinosaurs? Well, I really thought about it because my son LOVES dinosaurs, but I’ve recently done it in one of the MATS assignments so I wanted to draw something new. I also am not totally sure if dinosaurs are considered “animals”. Not sure if “currently living” is a requirement. My husband also mentioned hippos, which I thought was a possibility. I have seen hippos before when we were on a safari in Tanzania, and I adored them. There were always a bird on their heads / backs and they just chilled and didn’t mind it. They were also fierce animals. I was told that they would kill you if you blocked his path from land to water. So I sketched a few things. I sketched a hippo on a parachute and thought it was cute. I also sketched a hippo with a floating ring, it just didn’t make sense because they were good swimmers. Then I started drawing hippo as a super hero and named him Super Hippo. That rhymes with Super Hero and I thought that was cool. Husband thought so too. Besides, which boy doesn’t like super heros? Super Hippo that is. The path wasn’t smooth when I colored it. I originally did it in watercolor…. and yikes! It looked like a dinosaur or some kind of ugly creature. It didn’t look like a hippo at all. The worst thing is, I showed this to Connor, together with all my pencil sketches, and he literally said “I don’t like it”, repeatedly. And mind you he always liked everything that I draw !!!!!!! He has never really seen a floating belt in the 2.5 years of his time on earth so I could understand why he didn’t like those. He kept coming back to the elephant riding a bicycle, and he said he liked that one and only that one. I was shattered while mentally blaming my husband, and myself for listening to an engineer for artistic advices. I thought I was going to start over with the bicycle route, and mind you, two days have already passed at that time. Then Mr. Connor wanted to go draw pictures at my desk. There he saw the few vector versions of the hippo on my screen and he was interested. He said he liked them! Aww! OK, I am sticking to it then. Besides, I really didn’t have a ton of time to redo my character. I adored the flying pose, but the problem that bugged me was its face didn’t look like a hippo. It looked like some weird creature. It really reminded me of a ninja turtle (YIKES!). 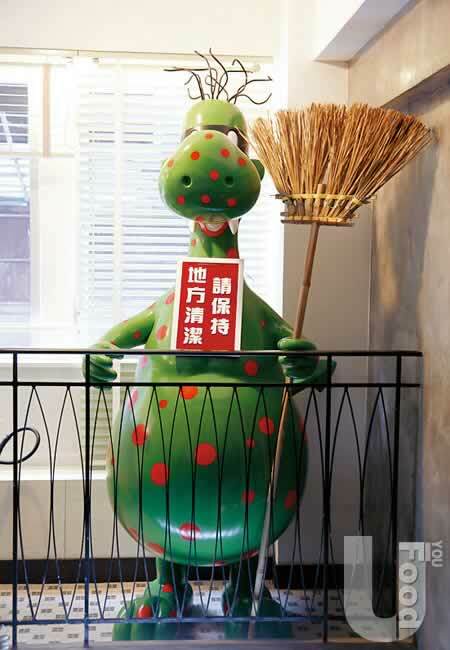 It also reminded me of the “Rubbish Monster” mascot from 1980s in Hong Kong. That was not cool at all yo. My husband said it looked like an alligator. Oh great. He has said if he opened his mouth and showed his teeth it may resemble a bit more as a hippo. After referencing tons of hippo photos and redrawing it continuously on paper, I finally came to something that looked more like a hippo. At least I hope it does! With a ton of tweaking in Illustrator, I came to a place that I was happy about and added in color pencil overlays. I put it on a t-shirt and it actually looked pretty good! I ended up only using a minimal amount of the color pencil overlays, as I thought it looked cooler with a grunge texture. I added extra assets (a sample storybook cover, and a repeat pattern on a pencil bag) to complete a mini-collection. It came together pretty well and I was happy about it finally! Then I was back into the place where I tweaked and tweaked, so I figured I needed to stop and submit it. I didn’t show anyone prior to submission this time because I didn’t have time, and I was afraid I’d lose my mind if people say it didn’t look like a hippo, or gave me other suggestions / animal ideas. I couldn’t afford to take it this time around! Last but not least, amongst the many (mean) comments coming from my husband, he did say one thing that I thought was very helpful. During one of the episodes where I whined how I was never gonna get through to round 3, he went, “so if (Pablo) Picasso was to enter this talent search today, do you think he would win? I don’t think he would.” for once I think he was so right! Then I saw this article from my MATS Bootcamp group, citing a bunch of rejection letters that were sent to famous people: Andy Warhol, U2, Madonna, and Tim Burton were amongst those! And Gertrude Stein! I will remind myself of that when I don’t see my name for the next round. So that was my little (long-winded) story. If you haven’t done so already, please go over to vote (for me)! Until next time…. This entry was posted in Art, Children, Design, Illustration and tagged animal, apparel, art, Character, child, Children, design, global talent search, GTS, hippo, illustration, Lilla Rogers, round 2, super hero, super hippo, T-shirt, toddler. Bookmark the permalink. LOL. I can totally relate to this Irene! So many choices! So many opinions. Congrats on a great piece! OMG, I just read your post and laughed out loud!! Haha! We went through the same impossible bumpy road !!! Thank you edorholt….! You are too sweet. I am holding my breath yet I am not holding my breath. I think my nerves got the best of me for the last round, and there are quite a few regrets on my entry. It is not good enough to cut through the caliber of work from the top 50! I am trying to not get too disappointed tomorrow….